Here below you can find our productions: the tape recorded for the 40th choir foundation anniversary, the CD In...canto da mezzo secolo and the book Coro Alpino Sestese, 50 anni di "Armonie" published in occasion of our 50th foundation anniversary, the live CD ConcerTiAmo which contains 20 songs that are representative of our history and its evolution. 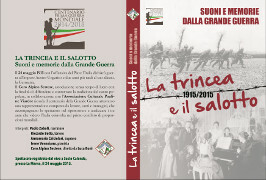 The last work is the DVD live which contains the recording of the show "La trincea e il salotto", presented on 24th of May 2015 to celebrate the entry into the First World War of Italy. If you are interested in our products (tape is sold out) please contact the choir sending an e-mail. Open the inside book (libretto). The price of the book is 7.5 Euro.